Maybe you have a large family and go thru a large volume of bath products and are looking for a better, more affordable way to restock your shampoo and conditioner. If you already have a shampoo and soap dispenser for your shower you probably already know that buying bath products in bulk is a convenient way to save money and eliminates the hassle of dealing with lots of small bottles that can clutter up your shower. Understandably you might think that buying any regular top-brand shampoo and conditioner would be the best option to fill your dispenser bottles up… But we beg to differ. There are better, cheaper options out there that will likely last you way longer – you just have to know where to look! Here are our picks for best bulk body wash, best conditioner and the best shampoo for you to use on your shower dispensers. However, these options that we’ve picked on each category might not be your top picks, so scroll down to read our whole review in order to properly evaluate if these would be good buys for you much will depend on your personal preference especially when it comes to particular fragrances. Bulk format shampoo, conditioner & body wash.
Price: There are some very expensive products out there, and when it comes to buying these types of products in bulk you have to be careful not to overpay, as companies tend to charge a lot for products that are simply not worth buying. Also, it’s easy to assume that everything in bulk is automatically cheaper but that is not necessarily true. It’s important to double check the price per fluid ounce to make sure you really are getting a better deal. Quality: Along with price, the quality of the product is the most important attribute whenever you make a purchase. Remember that you’re usually buying over a gallon when purchasing in bulks and if you get a lesser quality product you’ll be stuck with it for quite a long time. For most people buying bath and shower products in bulk, they are not necessarily looking for the very top luxury brands but still want good quality products, especially when it comes to products they use on their body. So the products we’ve selected stand out for their value/money ratio. Composition: While some of these large bulk format bottles come with a pump (or one you can buy separately) if you are using a wall mounted bathroom dispenser they may not all be capable of dealing with thick liquids, so it is important to choose a product that will adapt to most dispensers. Your body wash, conditioner or shampoo to have a fluid composition without feeling too “watery”, a balance which is often difficult to find. Botanicals Champagne Mimosa Body Wash by Ginger Lily Farms: This body wash often goes on sale and the price is very fair when looking at its quality. While remaining inexpensive, the product has great scents and they don’t appear cheap either. The liquid has a perfect consistency and should pass through dispensers without any problems, but the product doesn’t get to the point of being too “watery”. Buyers who would rather avoid “fruity” and too artificial scents might find this option as the best one out there, considering that the smells it offers are soft and don’t feel manufactured. Not only is this product a budget choice, it also seems to be a great one in general. Cucumber Melon Conditioning Shampoo & Body Wash by McKesson: This product might seem a bit too watery for some people, but in general, it has a very soft smell and does wonders for your skin. It tends to last a very long time, and the quality can easily be considered better than most commercial brands. It’s definitely an option to consider purchasing if you manage to land a discount on it when shopping. As a bonus, this product not only works well as a body wash but you can also use it as shampoo! If you’re looking to travel and need to save up some space, get one of these rather than two separate bottles of body wash and shampoo. 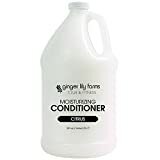 C and F Formula Conditioner by Ginger Lily Farms: Just like the first body wash that we reviewed, Ginger Lily Farms also offers a great budget option to those looking to purchase conditioner. In fact, this product is actually a perfect buy for the pumps of your dispensers. The smell doesn’t seem to be as good as the company’s body wash scents, but it still has a light, refreshing scent that some owners could find very appealing. If you have curly hair, this might be a great buy for you. It doesn’t weigh down your hair and it’ll clean it well enough, leaving it with a feeling of cleanness for at least a couple of days. scalp and helps to deal with minor skin conditions such as seborrheic dermatitis or stubborn dandruff. Some people who suffer from hair loss have also claimed to see benefits after using Nioxin’s hair products, and it also has a minty smell that compliments what it offers very well especially for people avoiding overly flowery or fruity smelling conditioner. If you don’t mind spending a bit more on quality toiletries, this is definitely a great option to consider for your house. Read recent reviews by customers that have used this Nioxin conditioner. This product might not be top-of-the-line salon quality shampoo but that is partly the nature of bulk shampoo and bath products as those luxury brands normally don’t sell in such a large budget format. If you are looking for really high end shampoo like L’Occitane Repairing Shampoo, the largest format we were able to find are these 16.9 oz refill bags. So for this category-overall bulk shampoos-the TreSemme is a decent quality option that also is a great value for money which is why it landed as our top pick. At just above the price of the cheapest products on the market, this shampoo should leave you feeling very clean without needing any sort of heavy or strong scents to do it. The small amount that needs to be applied allows owners to use it for years without having to replace it, and although it might make your hair feel a bit dry, you’ll almost definitely enjoy using it if you apply some conditioner to go with it. Botanicals Shampoo Gallon by Ginger Lily Farms: Ginger Lily Farms makes its way into another product of our review with one more quality budget option to take care of your hair. This shampoo should leave your hair shiny and feeling clean while the purchase also saves you some money. The fragrance might not be to to everyone’s liking but considering how good this shampoo cleans your hair, it’s still very much worth your purchase. We’ve given you plenty of choices in every category that we’ve reviewed, and there is one thing that seems to be recurrent and certain: the Ginger Lily Farm products do their job pretty well. You might not be getting the best conditioners, shampoos or body washes on the market, but you’ll definitely get a product that manages to do the job as advertised. These should all work very well on your dispensers as well. They aren’t watery by any means, but they aren’t thick either. If you’re looking to buy gallons on a budget, Ginger Lily Farm products might be exactly what you need. Check out our bathroom dispenser reviews if you need to purchase one for your bathroom!